In blender, puree fresh fruit with sugar, corn syrup, and lemon juice until very smooth, about 2 to 3 minutes. Add yogurt and blend until smooth. Taste mixture and adjust sweetness, adding more sugar if needed. Pour mixture into pop molds. Place tops on molds and insert wooden sticks. 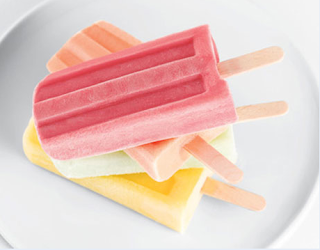 Freeze at least 4 hours before removing fruit pops from molds. * not sure about corn syrup, might skip that one? !